Are you in the market for the best hiking watch under $100 to fit your rugged, outdoor lifestyle? The right hiking watch must be tough enough for the harsh outdoor conditions. 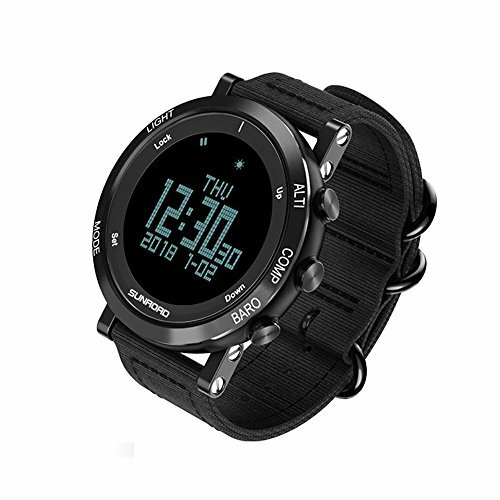 Of course, it also needs to have features such as an altimeter, barometer, compass, GPS, and many others – features that will improve your hiking experience as a whole. Sure, there are many high-end outdoor watches like the Suunto Traverse Alpha that can cost several hundred dollars. However, there is no shortage of budget-friendly watches for hikers of all skill levels. Today, we have a list of the best hiking watch under $100. When it comes to tough as nails outdoor watches, there’s plenty of options from Casio. If you want a durable ABC watch that won’t break the bank, the Casio SGW-1000-1ACR Triple Sensor is an easy recommendation. The Casio SGW-1000-1ACR is an outdoor watch that just works. It’s a triple sensor model so it features an altimeter, barometer, and a digital compass. For the most part, I am happy to report that these main features work well. The compass is accurate and can go several days without any recalibration. The watch also displays the temperature and barometric pressure with fair accuracy. However, the altimeter could use a bit of work. There’s a bit of a learning curve for operating the ABC features but once you get the hang of it, it becomes rather painless. 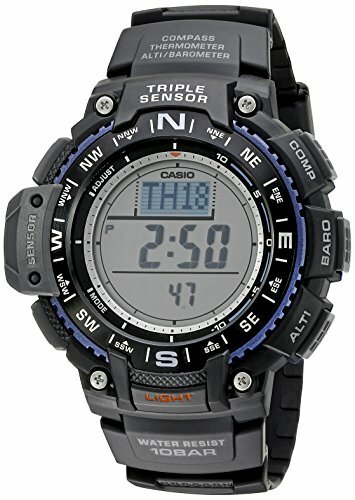 This watch boasts the signature Casio ruggedness and dependability. It is waterproof to 100 meters, so you don’t have to worry about the rain when you’re outdoors. The watch face is very easy to read regardless of the lighting conditions. When it’s dark, you can simply toggle the illumination and you’re good to go. For the price point, this watch offers incredible value. I love a good rough and tumble digital watch that can take a beating. 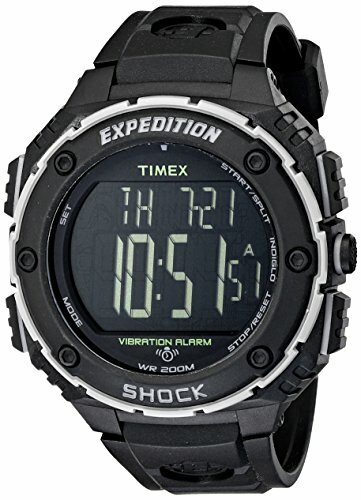 The Timex T49612 Expedition Shock is a popular outdoor watch and good reason. Well, mainly because it’s the best hiking watch under $100 with loads of features. Does anyone remember the old Timex advertising slogan? The Timex Expedition Shock embodies that tagline and then some. The watch is shock resistant to I.S.O. standards and is designed to withstand any outdoor test. Whether you are hiking, camping, or backpacking, this is the type of watch that you would want on your wrist. However, it’s tough and stylish enough that anyone won’t have any problem wearing this as an EDC watch. The durable resin case does a great job of protecting the face. Just to be clear, this is not an ABC watch but it does come with a digital compass. The compass works well but it does require a good deal of calibration. However, I suggest that you only utilize the compass for direction and orientation. The compass is not accurate enough to be used for navigation. The face is fairly large with a negative display. There are many complaints about the legibility of the face but for me personally, it’s just right. The only downside that I can think of is that the nylon strap is very prone to breaking off. Whether you’re looking for a hiking timepiece or simply a tough EDC watch, the Timex Expedition Shock comes highly recommended. Casio is truly a contender when it comes to high-utility watches that don’t cost an arm and leg. The Casio SGW100-1V Twin Sensor is a tough hiking watch that cost less than $50. 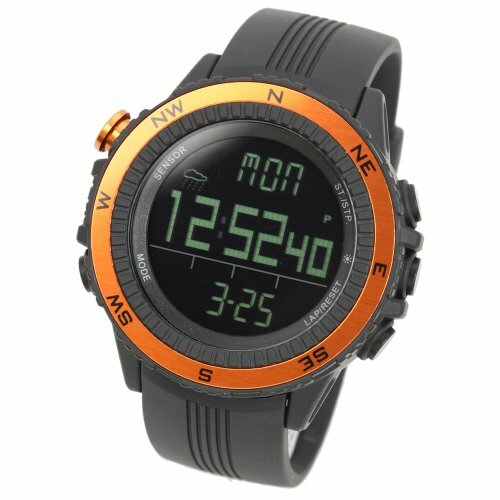 It doesn’t have that many advanced features but it’s a watch that will serve you well during your hiking trips. For starters, the Casio SGW100-1V looks great with a standard sports watch design. Thus, many of you will have no problem wearing it on a daily basis. The digital display is big and very easy to read, and shows the day, date, and month. 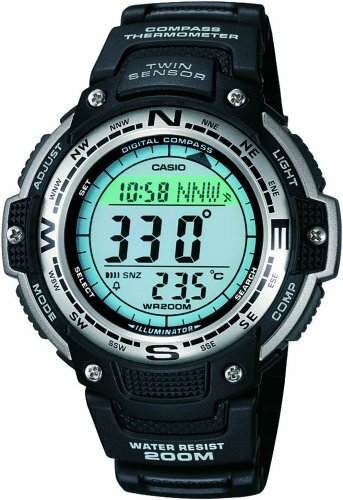 What makes the Casio SGW100-1V great for hiking is certainly the compass. The compass is very accurate provided that you will spend a bit of time with the calibration. Use the watch in conjunction with a map and you already got your navigation needs covered. It also comes with a thermometer but I found myself not using it at all. The watch utilizes the back plate for temperature readings which makes it inaccurate if you’re wearing it. If you want accurate temperature readings, you’ll have to strap the watch to your belt loop or backpack. Despite some glaring drawbacks, the Casio SGW100-1V is a high-performance outdoor watch in a durable package. The Sunroad Outdoor Sports Watch is the perfect cheapish ABC watch if you don’t have the budget for Suunto Cores. While you certainly can’t expect high-end features and quality from this model, it’s the best hiking watch under $100 that’s worth the look. At first glance, you’ll see that the design of the Sunroad Outdoor Sports Watch looks to be lifted from the Suunto Core, especially with the case and the band. One of the biggest differences is that the Sunroad watch features separate buttons for accessing the ABC features. I’d say it’s quite similar to the Casio ProTrek series. To switch between the altimeter, barometer, and compass features, you need to press the Mode button. After calibration, the Compass mode of the Sunroad works quite well. Unlike the Suunto Core, the compass still appears to be working while the backlight is enabled. For the Barometer mode, the watch shows the barometric, graph, and ambient pressure. Much like the compass, the barometer manages to impress. When toggling Altimeter mode, the altitude will be displayed in the middle while the time is displayed on top of the face. For a budget ABC watch, the build quality of the Sunroad is surprisingly decent. Definitely worth the price if you’re looking for a cheap Suunto Core alternative. For another best hiking watch under $100, we have another model from Timex. The Timex Expedition Grid Shock is a solid timepiece for those who often well, go off the grid. It’s another Timex model so you can expect legendary reliability from this watch. The Timex Expedition Grid Shock is a solid option for beginners since it focuses less on navigation and more on the smaller features. 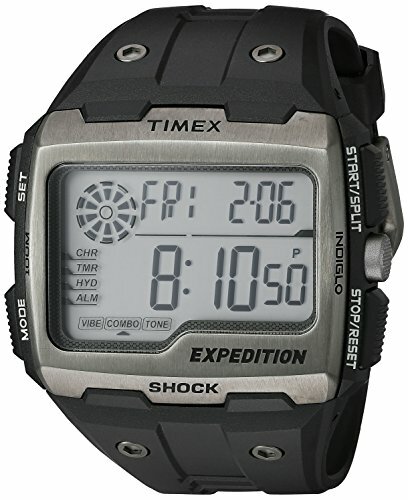 Like with the previous Timex watch, the Expedition Grid Shock features a shock resistance that’s in compliant to the I.S.O. standards. Yes, it’s a watch that can once again take a beating. Once you get the watch, you’ll be surprised that it’s a little larger than you thought it would. That’s certainly the case with me. If you have smaller hands, the size of the watch might be an issue. I highly recommend that you check the specs and decide if this watch’s size is right for you. The digital display looks crisp, clear and very readable. The Indiglo backlight provides just the right amount of brightness without blurring the display. One of the main reasons that I bought this watch is the vibration feature. Once set, the vibrations coming the from the watch is very noticeable. The vibration function works well with the watch’s hydration feature. Overall, the Expedition Grid Shock is a very basic watch but it’s a reliable, comfortable, and best of all, affordable timepiece. The Lad Weather Outdoor Watch is an ABC watch from a rather obscure brand. However, don’t let that scare you because this watch offers incredible value and is an amazing compass watch. The Lad Weather Outdoor Watch stands out because it’s more than an outdoor watch since it’s also an activity tracker. Fitbits and Garmins can be expensive, so this watch is a good alternative. The watch features a negative display which is just the way I like it. The watch is easily readable even under bright lights. For darker lighting conditions, it features a backlight that works great. As I’ve mentioned, the watch comes with an excellent compass. Once calibrated, I was surprised by its accuracy and it’s easily comparable with a magnetic field compass. The graphic display for the compass is one of the best I’ve seen in an ABC watch. The compass even works at night. Unlike most ABC watches, the compass continues to work even when the light is on. It’s certainly one of the best budget ABC watches that you can get. That concludes our list of the best hiking watch under $100. Regardless of your needs, the watches we’ve highlighted boast a good balance of quality and cost-efficiency. With these budget hiking watches, you can now hike with confidence. In case you are looking for a higher end watches for hiking, you may read our review of the best Garmin watch for hiking.